Lake Ridge at Joe Pool Lake is private, gated, lakeside golf community with rolling hills and a golf course lifestyle located close to the urban sophistication of Dallas, TX. Joe Pool Lake provides over 7,500 acres of water for boating fishing, sailing, skiing, windsurfing and sunbathing and a marina with a ship’s store and restaurant. A Southstar Development community, Lake Ridge offers incredible hilltop and lake views from which you can see for miles, something you just don’t get in the Dallas-Fort Worth area. One-half to two-acre homesites are available on which to build your custom home, with no set timeframe to build. The Tangle Ridge Golf Course is located adjacent to the Lake Ridge community and is an 18-hole championship public golf course featuring exciting elevation changes, subtle Champions Bermuda Greens, tree-lined fairways, and water and sand hazards. Tangle Ridge caters to every level of player with each hole varying in length, bunkering and style–offering a new direction, a new choice, a new experience every time you play. Voted as one of the state’s top public championship courses, Tangle Ridge Golf Course was designed by Jeff Brauer of GolfScapes in Arlington, TX. 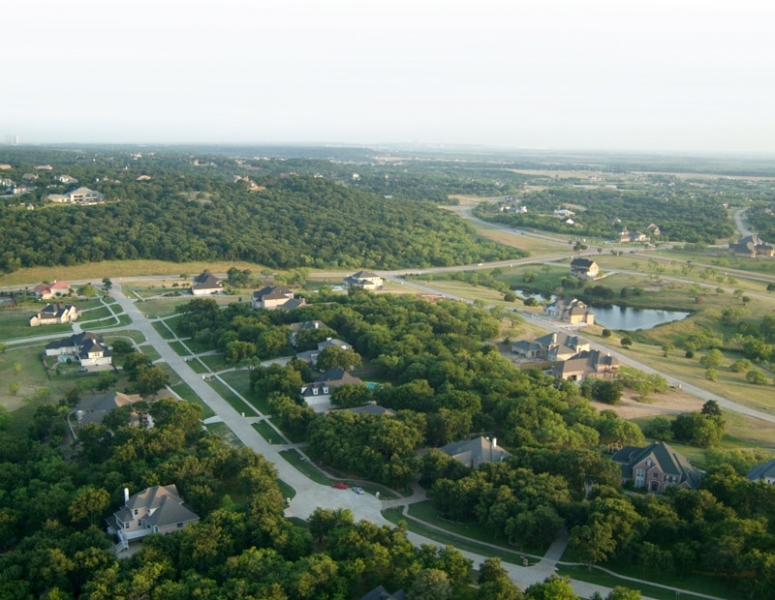 The Summit is “taking Metroplex living to a new level,” according to Southstar executives. Poised atop one of the highest peaks in North Texas, The Summit features 20-mile views of the Fort Worth skyline and Joe Pool Lake. A gated, custom home neighborhood, it features heavily wooded 1- to 2-acre homesites in a lush, natural setting. Overlooking the Metroplex skyline with lake and skyline views, The Summit offers a “luxury and convenience unrivaled in North Texas,” says Southstar. These homesites start in the $180,000s. The Sanctuary is Lake Ridge’s final lakeside neighborhood and it’s most desirable lake property release in more than 10 years. The Sanctuary is a luxurious, gated lakeside retreat with miles of spectacular lake and skyline views. These half- to one-acre homesites start in the $60,000s. The Preserve offers substantial value with 1- to 2-acre homesites starting at $49,900. This beautiful neighborhood is heavily wooded with a rolling terrain and offers some creekfront homesites. Private, gated, lakeside golf community developed by Southstar Development Co.
Lake Ridge is just minutes away from an exceptional selection of shopping and dining options in the Uptown Village at Cedar Hill, an upscale shopping center that opened in 2008 and features 350,000 sf of specialty stores and restaurants. Cedar Hill State Park is located just across the highway and is the biggest state park within 100 miles of Dallas with 13,086 acres and offers camping, marina, hiking and biking trails. The Dalls/Fort Worth Metroplex is beyond that and is the cultural and economic hub of North Texas. It is home to the Dallas Cowboys, Dallas Stars and Dallas Mavericks sports teams, the Nasher Sculpture Center, Dallas Arboretum, Texas Motor Speedway and a host of other exciting experiences. Lake Ridge is only 20 miles from downtown Dallas, a dynamic and progressive metropolitan center offering everything from chic restaurants to designer shopping. Downtown Forth Worth, with it’s decidedly Texas flair, is just 28 miles away. The state’s busiest airport, Dallas/Fort Worth International Airport, is only 28 miles from Lake Ridge.